Bette Davis & Joan Crawford (candid). 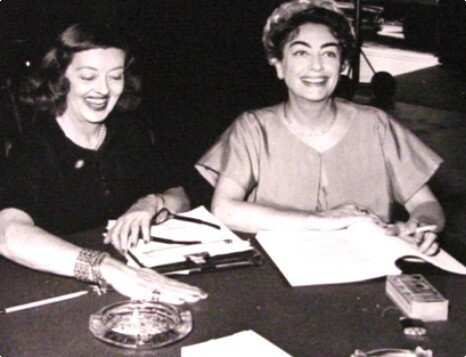 Bette Davis and Joan Crawford looking "chummy" on the set of Whatever Happened To abby Jane?. Wallpaper and background images in the phim cổ điển club tagged: bette davis joan crawford classic actresses classic movies candid photo. This phim cổ điển photo contains báo giấy, tạp chí, tờ báo lá cải, rag, tờ báo, giấy, báo lá cải, giẻ rách, and tờ báo giấy. There might also be dấu hiệu, poster, văn bản, bảng đen, ký hiệu, bữa tối, bữa ăn tối, and bàn ăn. I bought a heap of vintage photographs of classic movie stars recently. What I particularly like about these photos is that they are mostly candid - taken on movie sets,dressing rooms,out shopping,movie premieres,etc. *I have my name as the image credit solely because I have purchased these photographs and I have no clue who the photographers were. I believe (from the seller of the photos) that some might have been taken by fans. I bought about 80 for a great price. I won't upload all as it's too time consuming (on my dial-up) but I submit some of the nicest.